Inaki Aizpitarte is not a chef whose cooking leaves you indifferent. To some he’s a culinary genius and one of Paris’s most interesting chefs, to others his reputation is overrated, inflated by adoring fans*. I’m not sure that I would consider myself a fan, but I do like Aizpitarte’s cooking. Aizpitarte got started in the restaurant business late in life while travelling in Israel of all places, where he worked as a dishwasher and then later behind the line. It was enough to get him hooked on cooking and learn the basics before returning to Paris where he worked in Gilles Choukroun’s popular Café des Delices on the rue d’Assas. He eventually branched out on his own as chef of La Famille, which is where I first heard of him and tried his cooking. He then moved for a short stint at Le Transversal, the restaurant within the MAC/VAL modern art museum in Vitry-sur-Seine. I still remember my dinner there, a ten-course set menu for 38 €, which was my first introduction to modernist cuisine and very different from most of what was going on in Paris at the time. The first course was a lone apple seed on a large white plate, followed by a succession of interesting small plates like a cod-liver macaron, calamari with a « chorizo » foam, and a playful deconstructed pot au feu. I went with a group of French friends who absolutely hated it, but I was delighted to try such remarkable flavours, some delicious, some not so delicious, but interesting nonetheless (I wrote up the experience on eGullet at the time and was happy to see that the account, including other’s impressions, can still be found here. Transversal didn’t last long however and Inaki had already moved on to open Chateaubriand some 6 months later. 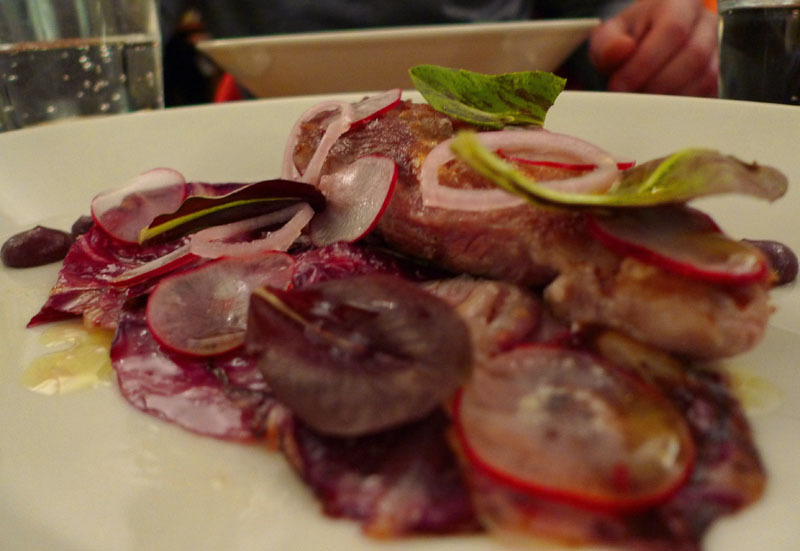 I have eaten at Chateaubriand a handful of times and some of the dishes I have had there have been startling, while others were less memorable which explains why it gets such mixed reviews. Placing 11th in Restaurant Magazine’s World’s 50 Best Restaurant list, ahead of Gagnaire, Robuchon, Barbot and Troisgros, didn’t help as Chateaubriand became a dining destination attracting culinary globetrotters with high expectations. But for 45 €, I think it is worth the gamble, as when his food is good, it is very good. 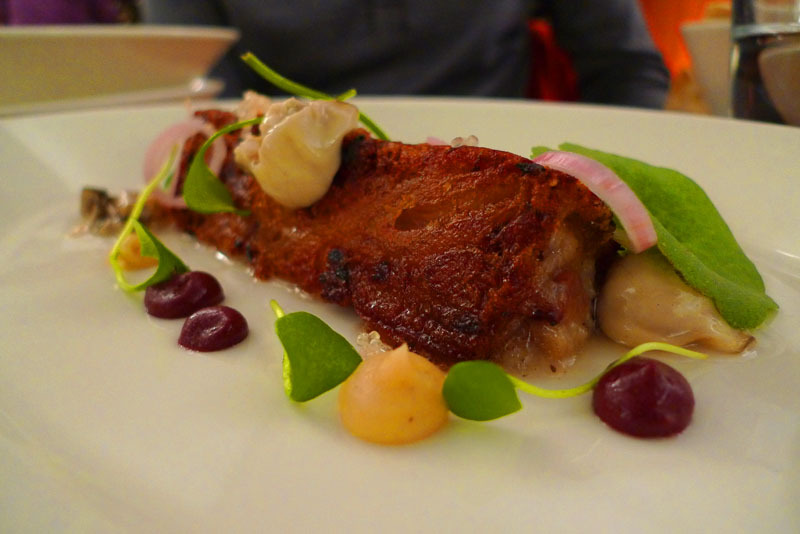 Aizpitarte recently took over Le Dauphin, a non-descript café a few doors down from Le Chateaubriand. He kept the name, called in Dutch architect Rem Koolhaas who gutted the place, transforming it into a modern white cube carved from Carrara marble, and serves small tapas-like plates and natural wines. It may be tapas, but it is definitely French. The menu, which seems to change often, includes Inaki’s modern and playful take on traditional French dishes like brandade, bœuf bourguignon, blanquette de veau, oxtail with carrots, oysters, steak tartare, and pig’s feet. 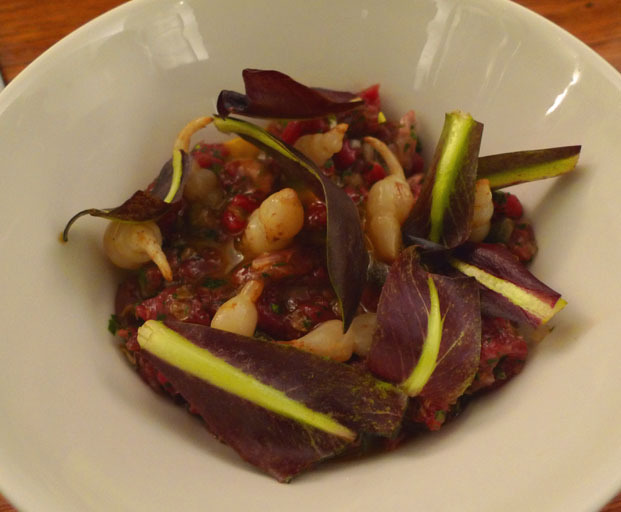 The steak tartare, with hand-cut steak, capers, fresh herbs, deep purple greens and crosnes, was outstanding and showed what good ingredients can do for a dish. 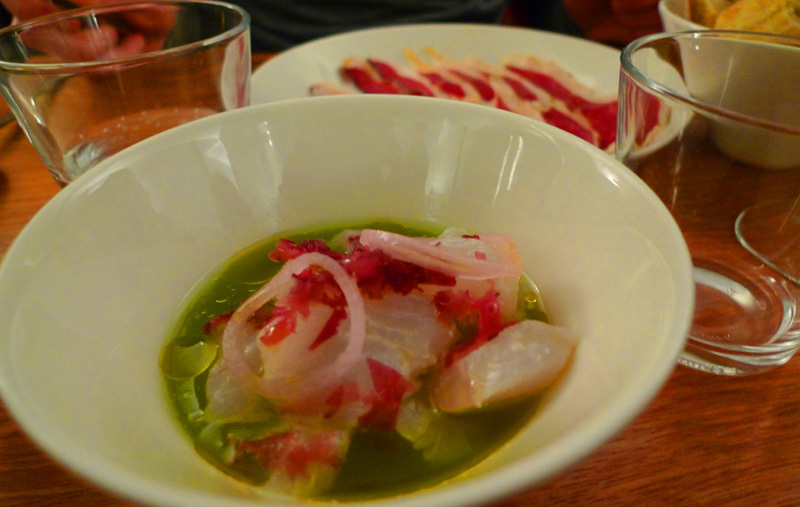 The delicate ceviche with cucumber water was another standout, along with the crisp pig’s feet with oysters and seared pluma with radicchio. Each original, potent bite had us trying to guess what a particular herb or flavour was and my only complaint is that there wasn’t more. Desserts included Aizpitarte’s take on French classics like apple tart, chocolate mousse, and a Saint Honoré. I loved Le Dauphin but can already see the naysayers coming and imagine that some people who travel great distances to taste Aizpitarte’s cuisine will wonder what the fuss is about. With such high expectations, it’s easy to be let down. I understand the criticism but even when Aizpitarte misses, I like what he’s trying to do. After all the media buzz that Chateaubriand has gotten, clearly he could have set his ambitions on a more well-heeled crowd, but I’m happy he chose to stay in the still-somewhat-scruffy part of the 11th, turning out his own style of inventive cooking, using exceptional ingredients, at affordable prices. In doing so, he makes avant-guard cooking, a little more accessible to all. *For some reason if you’re a woman and you like Aizpitarte’s cooking, you’re a groupie or fan–If you’re a man, well you just like his food. Go figure. This wine bar/cave à manger, recently opened in the picturesque Passage Panorama, is a welcome addition to the Paris wine scene. Bright and airy with a great terrace in a quiet part of the passage, with the warm weather coming, it’s sure to be a hit. Expect small plates of marinated anchovies, smoked fish, charcuterie, artisanal cheese, Isigny “special” oysters, sardines, and foie gras all washed down with a nice selection of vins naturels. A recent visit also included two plats du jour, andouillette or pork chops, served with homemade mashed potatoes. This tiny “bar à hors-d’oeuvres” recently opened by Yves Camdeborde, one of Paris’s most coveted chefs and proprietor of the impossible-to-book Comptoir du Relais, is certainly one of the best places to open in Paris this year. Anyone knowledgeable of the Parisian food scene will easily recognize Camdeborde, the jovial chef who unintentionally started the bistronomique food trend in 1992 when he gave up the world of Michelin stars by leaving the two-starred Les Ambassadeurs to open La Régalade, a modestly-priced bistro in the outmost corner of the 14th arrondissement. Other chefs soon followed suit and the Paris restaurant scene was transformed. Much to the dismay of foodies around the world, he turned over la Régalade to Bruno Doucet to open Le Comptoir du Relais, which soon became one of Paris’s most talked about tables. 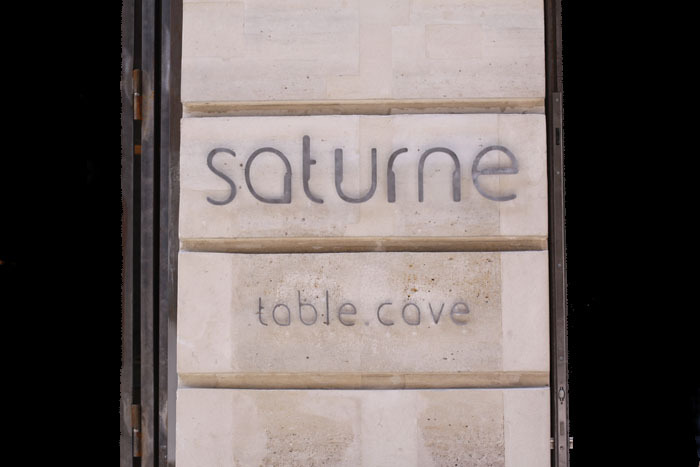 His latest endeavor, in a narrow non-descript space which adjoins the Comptoir, turns out delicious, affordable small plates of the highest quality along with interesting small-production wines. Steamed Camus artichokes dipped in olive oil, piping-hot, addictive croquettes filled with Eric Ospital’s Ibaïona ham, delicious chipolatas fried in duck fat with garlic, pig’s feet croquettes, plates of excellent charcuterie, and wonderful seared cêpes are only some of the tasty offerings on hand. Claustrophobics might want to abstain as it’s standing room only at the zinc bar laden with a communal bread basket, a tub of Bordier butter, white jars of pickles and peppers meant to be shared amongst your neighbors. 3, carrefour de l’Odéon, 6th.